A stage hazard is any aspect of a stage (that is, a stage element) which could pose a threat to players. Most stage hazards deal damage and knockback, while the remainder include a wide range of effects, such as sudden movements of the stage or a panning camera that can carry less agile characters into the blast line. A stage hazard should not be mistaken for any element which might aid or save the opponent, such as the Support Ghost in Yoshi's Island, although the same element may play several roles. How predictable a stage hazard is and how much influence it has over the match are factors usually considered when deciding stage legality. Stages with many or overwhelming hazards are typically banned in tournaments, as they tend to interfere with the outcomes of matches or because the competitors only value aspects of a match that they have control over without overcentralizing the match. Some stage hazards may be extremely minute or subtle, or only apply to certain characters. For example, the balloon in Smashville may unexpectedly collide with Ness's PK Thunder, making him temporarily vulnerable or leaving him in the helpless state if he is in the air. Stage hazards often play a role in improvised combos. In Super Smash Bros. Ultimate, stage hazards can be turned off. Static hazards generally stay in place or follow a set path and produce damage and knockback upon collision. Examples of stationary static hazards include spikes and lava; an example of a moving static hazard is the minecart in PictoChat. Some static hazards have a fixed knockback. Static hazards that cause damage but not knockback or flinching include hoop damage and the rain in the Kitty Cover mini-game on WarioWare, Inc. Blast hazards will appear and fire or explode over a period of time, entrapping players that come near their radius. The damage they inflict depends on how long the character remains trapped within the blast. Some blast hazards will seek a target before executing, such as the Combo Cannon on Halberd, while some will appear randomly, such as Banzai Bill in Peach's Castle. Launchers will quickly move the character from one part of the stage to another and sometimes into the blast line. The most basic example of a launcher is the catapult on Pirate Ship, which will only fling the victim to the far left of the pirate ship, while the victim suffers neither damage nor flinching. The Barrel Cannon in Congo Jungle is considered a launcher but not usually a hazard, because there is a brief period of time where the player has control over when it will fire. Rogue platforms are platforms that travel or move suddenly through a blast line. For example, if a character is stunned while standing on an Arwing in Sector Z, the Arwing may leave the scene and carry the character into the blast line. The track on Big Blue, the balancing platforms on Mushroom Kingdom, and any platform aside from the main one on Town and City may also be considered rogue platforms. Trapdoors are sections of the stage that can give way and reappear over a character, which usually makes returning to the stage difficult or impossible. For example, King Bulblin on the Bridge of Eldin can destroy the bridge, and players can be trapped below when the bridge is later reconstructed. Another example of a trapdoor hazard is the Drop Block in one of the default custom stages in Brawl. Trapdoors differ in terms of how they are triggered; some automatically open and close at timed intervals, some open based on proximity (with a delay before opening) and then automatically close some time later; and still others have to be manually triggered (such as by taking damage) in order to open. Transformations create a situation where the character can be caught under or off to the side of a stage because of a sudden shift in the stage. For example, the Frigate Orpheon stage can cause players to accidentally self-destruct when it flips upside down, and Orbital Gate Assault features many sudden transitions from one group of spaceship platforms to another. These should not be confused with trapdoor hazards; the difference is that trapdoors are located in specific portions of a stage, whereas transformation hazards specifically feature a (near) global change in the stage. Acid hazards, which do not specifically need to be acid, rise or pour in while covering a blast line. Collision with the acid will result in damage and knockback. In high hitstun and low percentage environments, characters will sometimes bounce around in rising acid. The first stage to feature an acid hazard is Planet Zebes. Norfair features lava in the place of acid. Predators will pursue the players and attack them. Some examples include the lookout cannons on Pirate Ship and the Arwings and Wolfen which swoop in and fire lasers around characters on various Star Fox stages. These sometimes overlap with blast hazards, such as the Combo Cannon on Halberd. 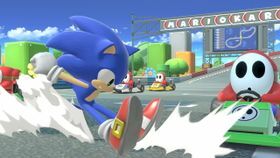 Vehicles may occasionally speed through some stages, causing damage and knockback to characters that collide with them. A warning or environment cue that a vehicle is approaching is usually given, such as a flashing exclamation point on Onett, or the vehicle can be seen from far away before arrival, such as the racers on Mario Circuit. Vehicle collisions may also trigger explosions on certain items. Vehicles are similar to mobile static hazards in that both pose a threat by slamming into fighters; the main difference is that vehicles briefly pass through the playable area at various intervals, while static hazards are either always onstage or remain onstage for extended periods of time, and vehicles also usually move quickly and warn players before their appearance, while static hazards can appear abruptly and usually move slowly (if they move at all). Vehicle hazards are not necessarily actual vehicles; anything that periodically rushes through the stage and damages fighters in its path, without lingering onstage for more than a few seconds, fits this hazard archetype. A good example is the Peckish Aristocrab in the Garden of Hope stage, which does not fit any conventional definition of the word "vehicle", yet has all the properties of a vehicle-type stage hazard (dashes through stage periodically and inflicts damage and knockback to all fighters it collides with, has a clear warning of its imminent arrival before threatening fighters, does not remain onstage for a prolonged period of time). Weather hazards affect physics. These hazards typically follow a change in scenery or a stage transformation; for example, the Flying transformation in Pokémon Stadium 2 introduces a weather hazard that blows gusts of wind upwards. Characters caught in the gusts have a dramatically reduced falling speed and are easier to Star KO and approach. Other weather hazards may affect the progression of time, such as Dialga in Spear Pillar. Slippery platforms make it difficult to control the momentum of traversing characters. In Brawl, slippery platforms may also increase the odds that a character will trip. This hazard does not affect the Ice Climbers. Switches need to be activated before any changes occur. Currently, the only switch that significantly threatens players is the POW Block in Mushroom Kingdom. Panning cameras force characters to follow the camera, as blast lines will move with the camera. Icicle Mountain features a camera that pans up the stage at varying speeds, which can catch characters with the lower blast line if they have poor jumping ability. Obstacles generally obstruct character movement or present a challenging gap to cross. While not dangerous by themselves, obstacles are often used in conjunction with panning cameras. Illusions are designed to affect the players themselves rather than the character, although they can sometimes lead to disorientation and self-destruction. Palkia on Spear Pillar can tilt the screen's orientation of the stage and invert player controls by mirroring the stage. Enemies generally appear as a species and can obstruct the player or cause knockback and damage. Enemies are similar to static hazards, but most enemies can be damaged and defeated or can be grabbed and thrown. One example of an enemy hazard is the Polar Bear in Icicle Mountain. Stage bosses are large enemies exclusive to Super Smash Bros. 4 and Ultimate. They are much larger than regular enemies, and can take a lot of damage before being defeated. They may also have other significant effects besides disrupting the battle, such as destroying portions of the stage, or awarding a KO to the player who defeated them. Monsters are large enemy species that cannot be defeated and can KO a player when hit, grabbed, or swallowed by. Some monsters include the Ultimate Chimera on New Pork City and the fish on Summit. While the Peckish Aristocrab on Garden of Hope exhibits characteristics of a vehicle hazard, as previously mentioned, it is also considered a monster by virtue of being a large, hostile living being that is immune to all attacks from the fighters. 3D Land The ? Blocks are already empty. The rocks don't appear in the second phase. The skewers don't appear in the final phase. 75m The fire enemies do not appear. Donkey Kong does not release the springs on the stage. The elevators are stationary. Arena Ferox The stage does not transform and is locked to a random variation. The statues of the first variation cannot be destroyed. The hanging platforms of the fourth variation never move when hit. Balloon Fight Fish and lightning bolts do not appear. The rocks under certain platforms cannot be broken. Big Blue The other F-Zero racers do not spawn, leaving the Falcon Flyer as the only platform. The Falcon Flyer does not fly offscreen and despawn. Boxing Ring The stage lights do not fall. Bridge of Eldin King Bulblin does not appear, and the bridge is never blown up. Brinstar The acid does not rise, and the fleshy parts of the stage cannot be destroyed. Brinstar Depths Kraid does not appear, and the stage does not rotate. Castle Siege The stage does not transform and is set to the castle's roof. Coliseum No platforms rise from the ground. Corneria Arwings do not appear, and the Great Fox's cannon does not fire lasers. Distant Planet The leaves and vine do not sink when stood on. It does not rain on the stage, thus the river of water never appears. The Red Bulborb does not appear. Pellets don't spawn. Dracula's Castle Candles do not appear. The moving platforms do not move. Dream Land Whispy Woods does not blow wind. Dream Land GB No changes. Duck Hunt The dog and ducks do not appear. The bush never appears. Flat Zone X The stage does not transition past the first form, the randomly moving Manhole platforms, the treasure diver, and the firemen do not appear. Figure-8 Circuit No karts are on the track. Find Mii Dark Emperor does not appear. The cage stays stationary at all times. The platforms never collapse. Fountain of Dreams The left and right platforms do not move. Fourside The UFO does not appear, and the platform and crane do not move. Frigate Orpheon The stage does not flip, remaining only in the first area. Blackouts do not occur, and the platforms that move in from the left and right blast zones are gone. Gamer 5-Volt does not appear and the fake-outs do not occur. If present, 9-Volt's gamepad will remain off and the sketchbook will only show Mona. Garden of Hope The bridge, pots, sticks, Pikmin, and Peckish Aristocrab do not appear. The lifts do not fall. Gaur Plain The springs do not appear and Metal Face never appears. Gerudo Valley The bridge cannot be destroyed. Koume and Kotake do not appear. Golden Plains Coins do not appear, and the stage does not scroll. The moving platforms don't move. Great Bay Tingle does not appear. The turtle never moves. Great Plateau Tower The top of the tower does not take damage and cannot be destroyed. Green Greens Whispy Woods does not blow wind, and there are no falling blocks or bombs. Green Hill Zone Checkpoints do not appear, and the stage no longer crumbles. Halberd The Combo Cannon never attacks. Hanenbow The leaves do not tilt and change color when attacked, and the Hanenbow creatures do not appear. Hyrule Castle There are no tornadoes. Jungle Japes Klaptraps do not appear. Kalos Pokémon League The stage does not transform. Kongo Falls Klaptrap, the launch barrel, and the log platforms that flow in the waterfall do not appear. The main raft platform is no longer moved when fighters stand on it. Kongo Jungle There is no Barrel Cannon, and the rotating platforms do not move. Living Room Blocks and other miscellaneous items only spawn once and never disappear. Luigi's Mansion The support pillars cannot be broken. The moving platforms don't appear. Lylat Cruise The stage does not tilt and only uses the Starry Space background without the space warp. Magicant The Flying Men, trees, Mobile Sprouts, Sky Runners, tomatoes, octopus statues, and Dungeon Man do not appear. Mario Bros. The Shellcreepers, Sidesteppers, and POW Block do not appear. The blue platforms do not bump up slightly when hit from below. Mario Circuit No karts are on the track. Mementos The top right platform, ceiling, walls, and trains do not appear. Midgar Summon Materia never appear. Mute City SNES The Blue Falcon is always the only vehicle onscreen. The moving platforms never move. Mushroom Kingdom The balancing platforms in the middle are not there, and Piranha Plants do not spawn. It is impossible to use the Warp Pipes. POW Blocks don't appear. Mushroom Kingdom II Birdo and the Pidgits do not appear. Mushroom Kingdom U Kamek never appears, so the stage never transitions past the first form. Nabbit, the beanstalk, the icicles, the geysers, the Big Urchins, the Stretch blocks, and other hazards do not appear. Mushroomy Kingdom The ? Blocks are already empty. New Donk City Hall The moving platforms on some stops do not move. Pauline and The Super Mario Players never appear. New Pork City The Ultimate Chimera does not appear, the ship pendulum does not swing, and the platform at the bottom cannot be destroyed. Norfair None of the lava obstacles appear. Onett The cars do not appear. The Drug Store sign cannot be attacked. Pac-Land The fire hydrants don't shoot out water, the water geysers don't appear, the logs don't fall, the cloud platforms never move, and the springboard doesn't work. Paper Mario The stage never transitions past the first form. The fan never appears. Palutena's Temple The spikes do not appear. The bridge cannot be destroyed. The moving platforms do not move. The top left mini-stage does not move. The spring does not appear. Peach's Castle There is no Bumper, and the bottom platform does not move. Pictochat 2 Drawings do not appear. Pilotwings The stage does not change from the red biplane, and it does not tilt. Pirate Ship The ship's catapult is never used. Enemy lookouts that fire bombs, the King of Red Lions, the storm cyclone, and the small rocky island do not appear. Pokémon Stadium The stage does not transform. Pokémon Stadium 2 The stage does not transform. Port Town Aero Dive No cars appear on the track. Princess Peach's Castle Banzai Bills and switches never appear. The platforms that would normally rise when stood on are now stationary. Rainbow Cruise The stage never transitions past the flying ship. Reset Bomb Forest The stage never transitions to the second form. Saffron City The door of the Silph Co. building never opens to spawn Pokémon. The hovering platforms on the left do not move. Shadow Moses Island The watchtowers cannot be broken. Skyloft The stage does not transition to any other forms. Skyworld The solid part of the stages are not destructible. The lower moving platform does not appear. Smashville The soft platform does not move. Balloons do not spawn. Spear Pillar Dialga, Palkia, and Cresselia do not affect the stage when they appear. The floating platforms never move. Spirit Train The final car never changes from its initial basic form, and the blast zones no longer move about as a result. No Dark or Armored Trains spawn. Summit The fish does not appear. The ice platform cannot be destroyed. The icicles don't fall. The left platform never falls from standing on it. The ice block and cloud platforms never appear. Super Mario Maker The stage is still randomized, but moving platforms, brick blocks, rotating blocks, ice blocks, lava, and other disruptive elements are never part of the layout. Super Happy Tree The clouds do not disappear. The Great Cave Offensive The mine carts and treasure chests do not appear. Tomodachi Life The walls covering all the different rooms are always invisible. Tortimer Island No fruits appear on the trees. The boat and the shark do not appear. Town and City The stage still transitions between the town and city, but the platforms within each form do not move outside of the transition. Balloons do not spawn. Umbra Clock Tower The pieces of rubble serving as temporary platforms do not appear, leaving the clock tower itself as the only platform. Unova Pokemon League Zekrom and Reshiram do not appear. Venom Arwings and Wolfens do not appear. WarioWare, Inc. Microgames do not occur. Wii Fit Studio The platform layout never changes. Wily Castle The Yellow Devil and moving platforms do not appear. Windy Hill Zone The windmill does not move, and the spring does not appear. Wrecking Crew The walls do not break. Bombs and barrels do not appear. Wuhu Island The stage remains in its initial floating platform configuration, never stopping to land at any point. Yoshi's Island (Melee) The Rotating Blocks do not move. Yoshi's Island Soft platform does not tilt. Blarggwich and Fly Guys do not appear. Yoshi's Story Randall and Shy Guys do not appear. Additionally, several roaming or transforming stages stay locked in a certain stop in certain spirit battles. This page was last edited on April 19, 2019, at 17:43.